As the weather warms I start to get the itch to get my hands in the dirt to clean out the garden beds, and start propagating the soils in preparation for spring and summer blooms. As our gardening centers begin stocking early annuals, it takes some serious self-control not to walk out with a new plant (or 10) every time I visit. This last trip happening to be too much for me, and after running my credit card to pay for my large purchase, my head was full of plans to where to place all my new blooms. 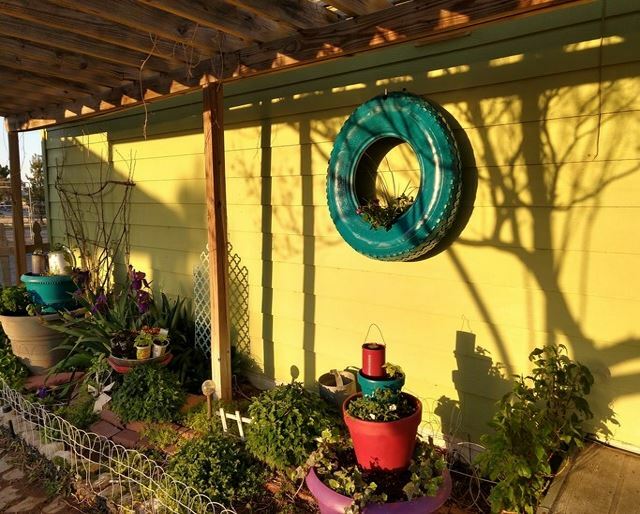 Like most DIY enthusiasts, I collect ‘ideas’ to play with, and the old tire I’ve had leaning against the garage was earmarked as a planter of some sort for quite some time now. With a little research, a few lessons learned, and not much time at all- I had a wonderful wall planter for some of my new buys. 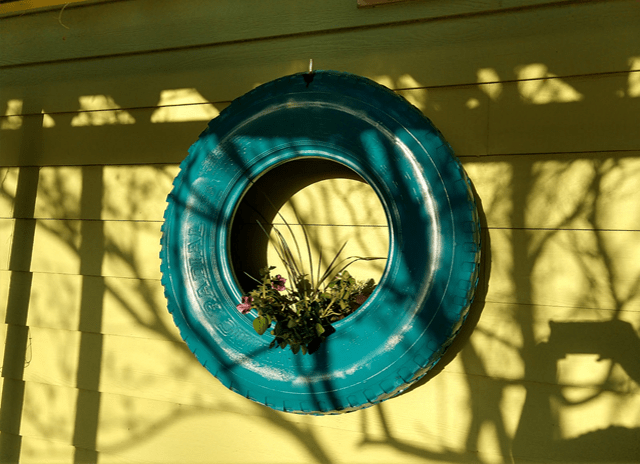 If you have wondered how to make a hanging tire planter, this is an easy DIY project that you can get complete in just a few hours or less. Of course, your DIY project should be made all your own, and I’ll provide alternative suggestions throughout this tutorial. But at a bare minimum, you should have the following in order to create something similar to what I have. 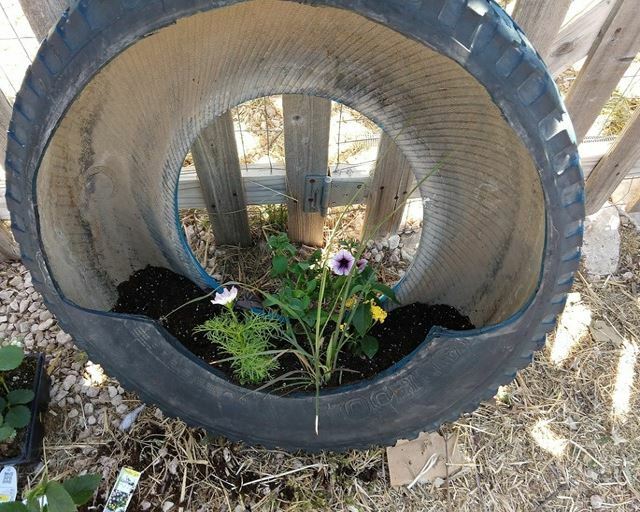 Old Tire: Any old tire will do, but keep in mind that if you are hanging this you will have to provide enough support for the weight of the tire and wet soil after planting. Tires are easy to find, and mine was picked up off the side of the road down a rural dirt road where people (unfortunately) dump their unwanted items. Many tire shops or local dumps may even give you an old tire for free. 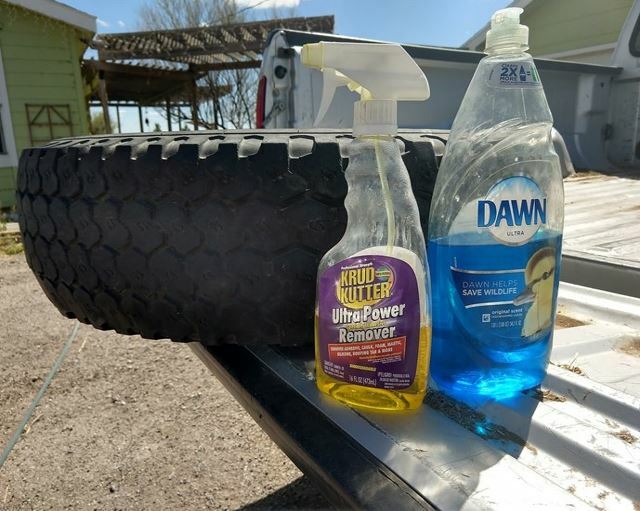 Degreaser or Tire Cleaner: You are going to have to clean the outside of your tire, especially if you plan on painting it. Remember, tires are exposed to literally EVERYTHING on the road- and you will want to clean it up as best as possible. 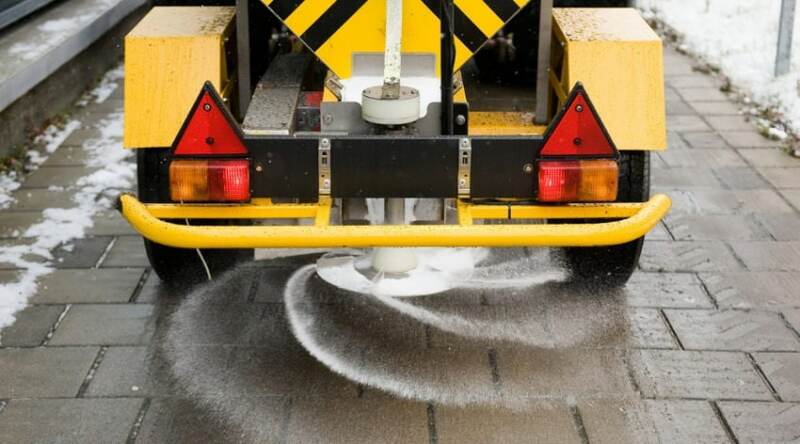 A degreaser will help remove the road oils that have built up over the years of use. Dawn Dish Soap: Dawn dish soap is known for being a powerful, environmentally friendly product that helps cut grease and dirt. Chalk: If you plan on cutting your tire (and I suggest you do for various reasons, listed below), you will want to mark where your cuts are going to be. This also allows you to try out different ideas prior to cutting. Box Cutter: There are a few things you can use to cut your tire, but I found the easiest way to cut your tire is with a sharp box cutter. Hanging Hook: No matter how you decide to hang your planter, you will want to choose a sturdy, durable hanging hook. Choose one that has at least a 75 lb test limit. Planting Soil: A good planting soil is your best choice for long-lasting, seasonal blooms. Plants: a mix of 3 to 5 annuals of various heights. Plants that grow and drape over the lip of your planter are popular choices. Eye and Hand Protection: Any time you are using power tools or handling knives, etc, it is good practice to provide some protection to both eyes and hands. 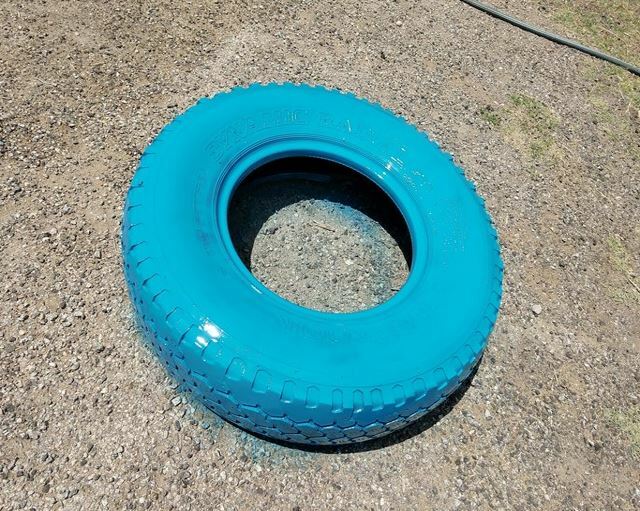 Spray Paint: You can paint your tire to match your decor if you wish. 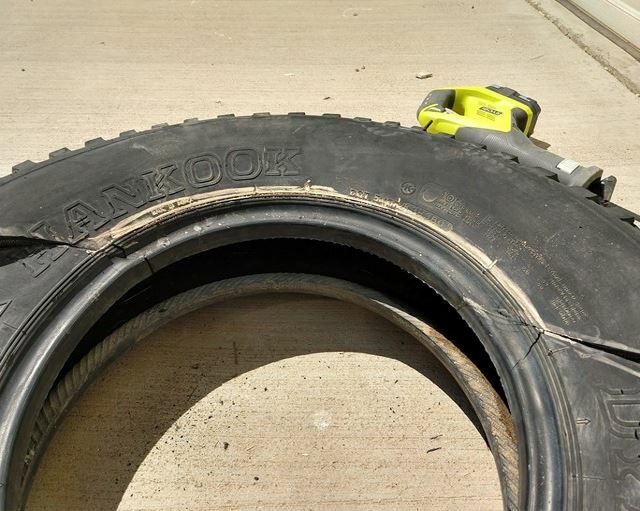 Sawzall: A Sawzall can be used to cut your tire rather than a box cutter. 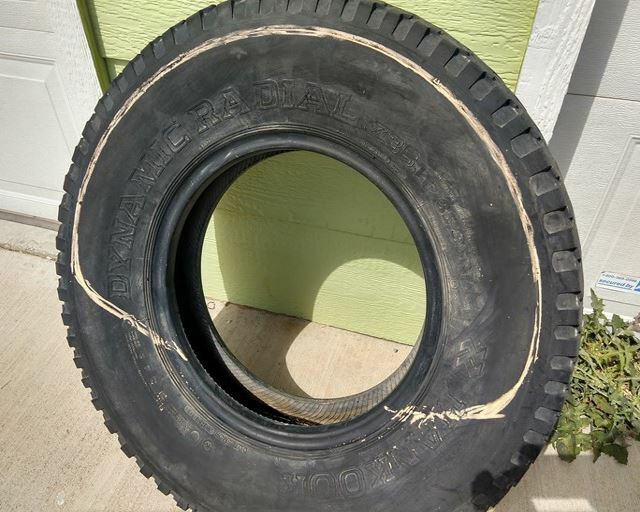 Just be sure not to try and cut through the wire that reinforces the edges and treads of the tire or it will dull your blade. Grinder: If you do want to cut through any wire reinforcement, a grinder is your best bet as they are made specifically to cut through metal. A rotary Dremel tool can also work for this. Drill: Depending on how you hang your tire, you may want to drill a hole through for balance. As mentioned, your tire has collected and been through everything you can imagine on a road- and then some. Spray your tire down with degreaser (or tire cleaner) and then scrub with warm soapy water for any project you have in mind for it. 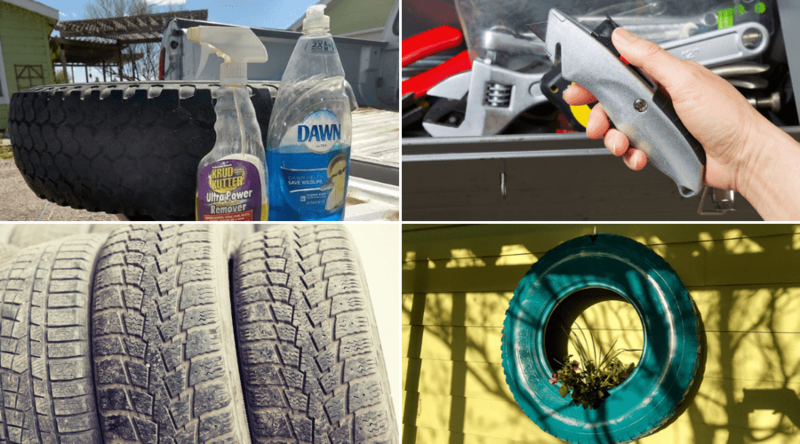 You may not get it totally clean, as your tire may leave behind some black residue on your hands, but the cleaner you get it the better it will take paint later on. After cleaning, allow to dry, and then wash again to ensure you have removed as much dirt and grime build up as possible. 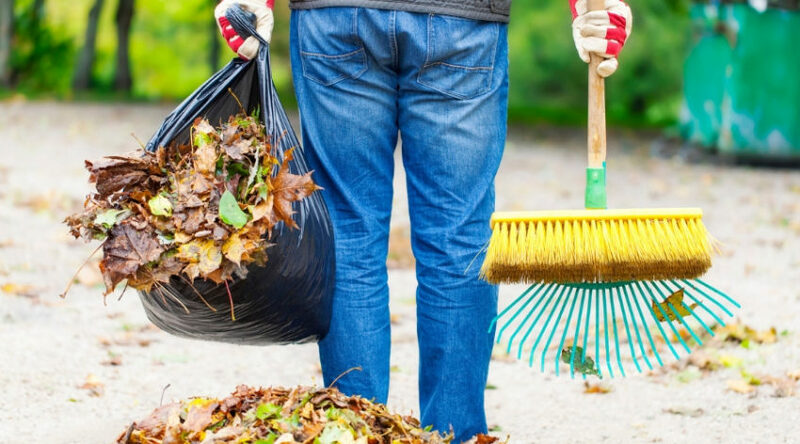 Your tire may look clean, but it is amazing how much dirt will be left behind after an initial cleaning. Mark your cuts using chalk so you have a visual of what you want to create. You can do a few things by cutting your tire. My purpose was to allow a bit of lessening weight and to provide easy access to the back of my tire for planting. 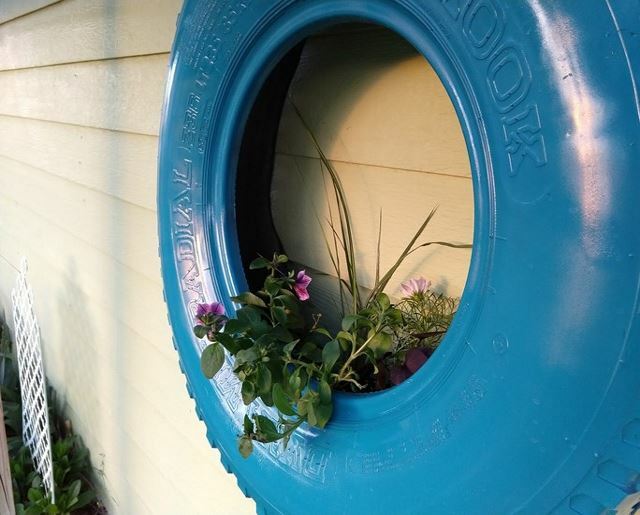 But you can cut to create scalloped (or similar) designs to the front of your tire, you can follow a similar pattern as mine on both side of the tire to create a free hanging planter (such as a basket), or you could leave the tire as is. My initial plan was to cut through the wired inner rim using a grinder until I discovered I had loaned my grinder to a friend and did not have it on hand. So I altered my plan to cut that area out in order to keep moving forward with the project. tires are large, and it is easy to interrupt the scale of your work without a guide to help you. Chalk wipes clean easily if you make any mistakes, and also allows you to see if this is what you really want. As you can see, I changed my original plan after realizing I did not have the tool I needed. Now is the time to make your cuts if you have chosen to do so. Initially, I was going to use my Sawzall, but since I was unable to make cuts along the edge to get started, I switched to a box cutter. Originally I was simply going to cut enough to allow for the Sawzall blade to fit but discovered that I could easily pull the box cutter through with very little effort, and just decided to continue with how I started. 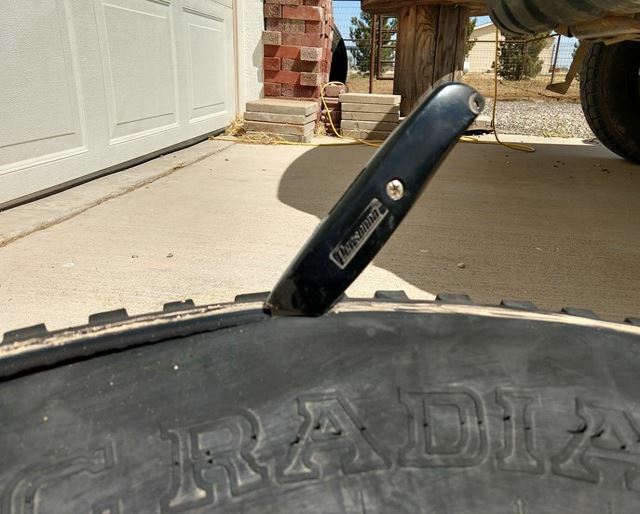 Either tool will get the job done, but since this was my first time cutting up a tire I was glad to discover that I had alternative ways to complete the task. This is extremely helpful if you are like me and like to get a job done with what you already have without having to purchase anything extra. You may want to give your tire surface another cleaning before you do this to ensure even, long-lasting coverage. By now you may have discovered that your tire is seriously dirty after handling it as much as you have. 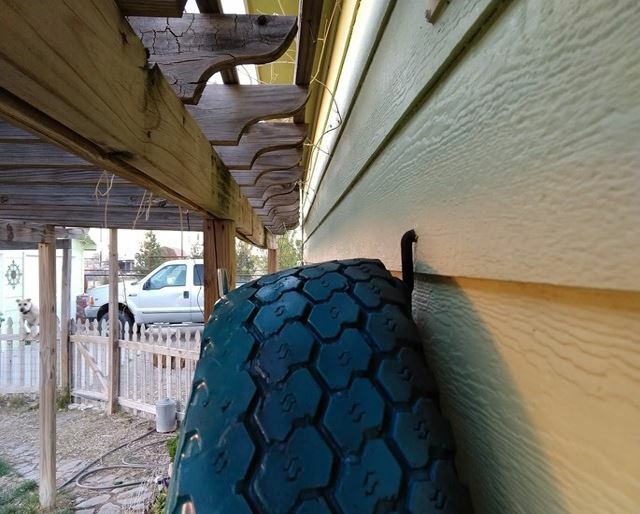 I mentioned I was cutting the back of my tire, so I had no reason to paint the side that was going to rest against my outdoor wall. 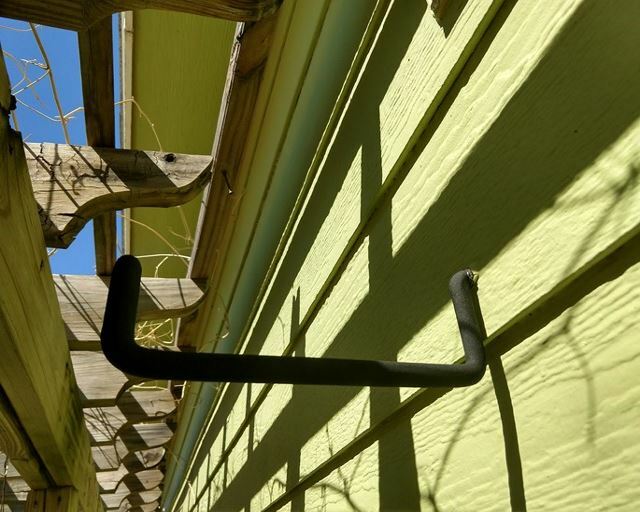 Spray paint rarely applies evenly after only one coat, so after the initial coat, allow it to dry briefly and go back over it for a smooth, shiny surface. Choose a hook that can support the weight of your tire. Ideally, you need to locate your studs to drill into, but if you have a placement that is void of stud support- be sure to purchase the correct hardware. I chose these rubber coated steel hooks that I have had good luck with in the past. This design allows for the weight to be both upon the end that screws into the wall, as well as the wall itself due to the shape. Plus, they are inexpensive! Drill your pilot hole using a smaller drill bit than the screw size to ensure you get a snug fit. 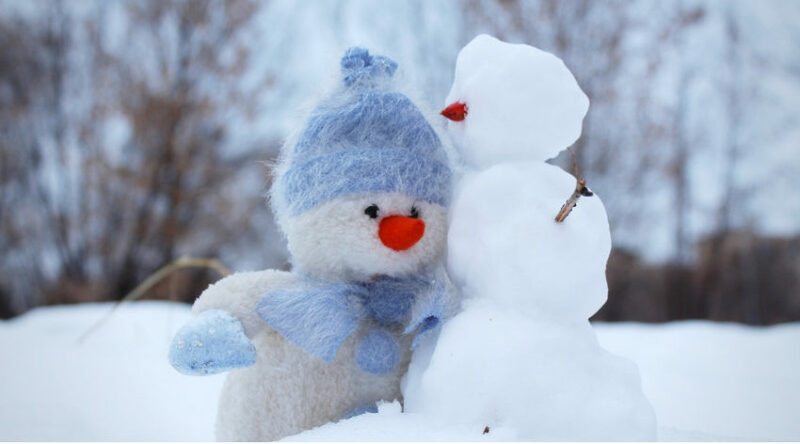 If you are still concerned about the weight limit, you can also reinforce using differing hardware solutions. Don’t be afraid to talk to a store employee about your project if this is your first time hanging a heavy object on your wall. You can see my hook pointing through the front of the tire in this picture. Originally I was unsure if I would need to do this, but after hanging my tire to see how well it sat against the wall, I found that it was unbalanced. To solve this I simply marked where the lip of the type of hook I choose sat within the tire and drilled a hole large enough for it to slip through. This allowed the tire to sit flush against the wall as I wanted. Avoid drilling holes until you know how your tire will balance. Also, be careful not to drill through and steel belts unless you have the correct bit. If you are worried about the water that will sit in the bottom of the tire sapping your plant roots of oxygen, drill a few drainage holes slightly off center to allow an excess of water to drain through. 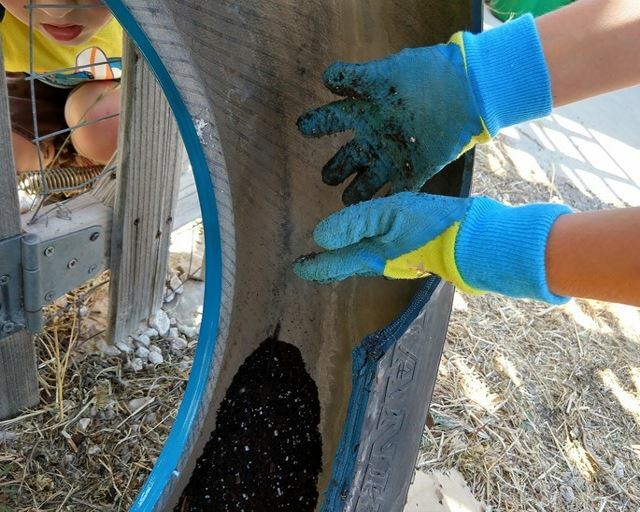 I did not do this as I live in a very dry, very hot area and have found that lining my planters with waterproof materials keep my plants thriving and growing- otherwise, the water I provide dries up much too quickly. 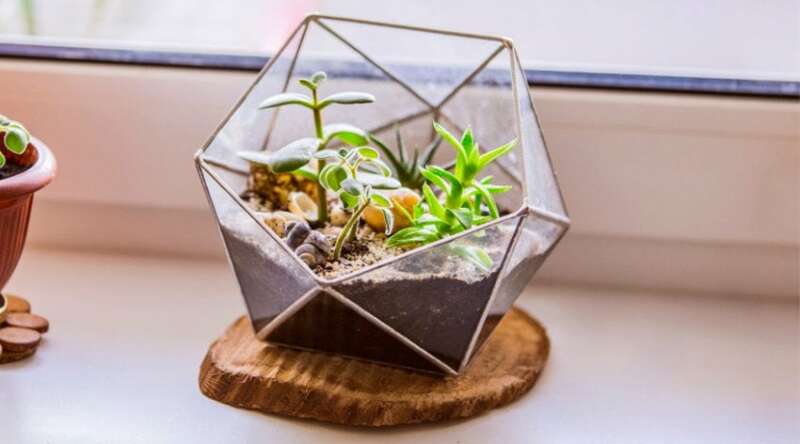 You can also add some rocks to the bottom for drainage and to keep the water off roots if you do not want holes, just remember that rocks will add extra weight. As you can see, the part of the tire I removed allows for very easy access to the inside of the tire. This was a great step to get both my children involved (you can see), to both fill and supervise the process. Fill your tire bottom to the lip, leaving enough room for your plants. You can always go back and fill in more dirt as needed. As with any planter, choose your plants with an eye towards color and texture. I eventually added in 5 different plants- including grass and a potato vine that will eventually hang through the opening and drape towards the ground. The inside of the tire allows for PLENTY of planting space to take advantage of. Don’t be afraid to use up the areas to the side of the opening – especially if you are planting any sort of draping, hanging type plants. Now is time to get your planter in place! The dry soil and plants will not have added too much more weight to this yet, but have somebody help you if this is difficult. Plus you don’t want to accidentally drop, or spill, all your hard work and plants out to have to start all over again. Do NOT water until after you have hung your planter! This will make it that much heavier! NOW you can water your plants! Tires are long-lasting and heavy duty and this planter should last you many years. As you can see I matched mine to some of my previous projects and the draping vines should provide a nice visual balance as the season progresses. The inside of the tire is also a great place to hang some lighting using solar light solutions. I hope this was a simple enough tutorial to follow and inspired you to take advantage of reusing old tires you may have. I had a lot of fun learning new techniques while creating this and can’t wait to create more, similar, planters. If you have any questions or comments, we’d love to hear from you below. This is also true if you have any awesome tire DIY projects you would like to share! And, as always, please share this article as well!